Applicants for Nth Dimensions' programs will need to complete an application for each program of interest as well as provide all supporting application materials digitally. If you have any specific questions about our programs, please contact us at: programs@nthdimensions.org. After undergoing a stringent and competitive application process, 20 first-year medical students are selected to participate in this eight-week clinical and research internship with orthopaedic surgeons nationwide. The orthopaedic surgeon preceptors are members of varying ethnic and gender minority groups who have been specifically selected because of their teaching and mentoring achievements in the field of orthopaedics. This is a four-year developmental program (see details below) that is designed to expose medical students to the field throughout their medical school matriculation. During the student’s 2nd-4th years of matriculation, the students receive core support from their internship preceptor and are encouraged to develop relationships with other orthopaedic surgeons through interactions and mentoring activities during annual programs at the annual meeting of the AAOS, J. Robert Gladden Society and Ruth Jackson Orthopaedic Society meetings. Medical students from across the country participate in a full day of activities during the AAOS meeting which include the Annual Trilogy Breakfast, visits to the exhibit hall, the annual luncheon of the J. Robert Gladden Society, and afternoon plenary sessions. Nth Dimensions awards housing grants to approximately sixty selected students to attend the annual meeting. Interview grants will be made available to support fourth-year medical students' travel and accommodations during their fourth year orthopedic surgery interviews. Orthopaedic surgery textbook scholarships will be awarded annually to Nth Dimension medical students matching in the field of orthopaedic surgery during their fourth year of medical school. 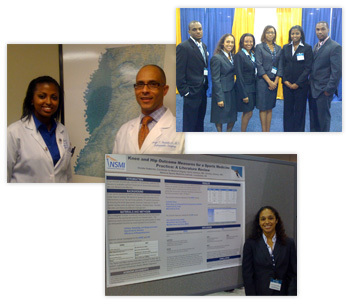 Annual research grants are made available to medical students who endeavor to initiate, complete or present a research project started during their internship program. Research proposals are submitted along with a letter of support from the intended research preceptor.